Annie Moore and her brothers Anthony (l) and Philip (r) at Ellis Island (colorized). Megan Smolenyak writes about a decade-long search that finally turned up the Irish cousins of Annie Moore of Ellis Island fame. Thanks to improved access to a variety of resources, Irish genealogy is gradually becoming easier, but challenges remain, and one of the most daunting is finding living relatives. When Annie Moore, the Irish teenager who was the first immigrant to ever arrive at Ellis Island tripped down the gangplank, she walked into the pages of history. Forgotten during her lifetime, she would undoubtedly be stunned to learn that she has become a poster child for immigration in a nation of immigrants and of the diaspora in a country known for its emigrants scattered to all corners of the globe, and that there are statues of her in both New York and Cork. Like so many immigrants of her time, Annie lived a hard scrabble, tenement-based life in the Lower East Side of Manhattan. Half of her children would die by the age of three for reasons attributable to poverty, and she would join them in an unmarked grave at 50. But those who survived flourished, and her descendants today are a living testimony to Annie’s courage and sacrifices. Could Julia’s mother have been a Cronin by birth and by marriage? Back in 2006, I tracked down Annie Moore. In what amounted to a historical case of identity theft, experts had latched on to another young woman of the same name, but four years of sleuthing led me to the correct one. Within days of discovering the true Annie, I located most of her living American relatives, so then set my sights on finding her Irish kin. That’s when things came to a screeching halt. Over the ensuing years, I’ve been sporadically inspired to have another go at ferreting out her elusive Irish cousins, but never had any luck. January 1, 2017 will mark the 125th anniversary of Annie’s arrival, so this past New Year’s, I resolved to smoke out her family before that milestone. It took ten weeks, considerable digging, and a dash of good fortune, but this decade-long search has finally met with success, and her new-found relatives are delighted. Meeting cousins in Ireland tends to be high on the wish list of Irish Americans interested in their roots, so I thought I’d share a digest version of my research trail in the hope of providing guidance for others’ quests. The example I’ll walk through pertains to the maternal side of Annie’s family tree. I had the advantage of knowing that Annie’s family came from County Cork, which should have given me a running start, but this was counterbalanced by the prevalence of her parents’ surnames. Moore is widespread on both sides of the Atlantic (ranked 9th in the U.S. and 20th in Ireland), but her mother’s maiden name of Cronin which sounds somewhat distinctive turned out to be wildly common in Cork. Genealogists dread such names because they mean extra work sifting through contenders, so I wasn’t thrilled to learn how rampant it was. To help cope, I enlisted the aid of a Cork-based friend, Tim McCoy, to round up baptism records for Annie and her siblings. Since baptismal sponsors are often aunts or uncles, any Cronin godparents might be siblings of their mother, Julia. Two emerged – Mary and Anne. I would have preferred Priscilla and Genevieve, but at least I had a pair of names to vet any Cronin families I might investigate. Richard, a blacksmith, appeared in the 1911 census with his family in Cork. It bears mentioning that this research would be much easier to do now with the freshly released Catholic parish index (on Ancestry.com and FindMyPast.com), but they’re not comprehensive. In this case, old-fashioned gumshoeing turned up one more baptism than the online collection. Also, slogging through digital parish images, as I did, without an index can be time-consuming, but sometimes produces more accurate results. For instance, within days of the index becoming available, I tripped across a John from Annie’s family transcribed instead as Julia, so there’s still occasional benefit to doing things the hard way. While Tim dug around Cork, I focused on New York. Annie’s mother’s death certificate indicated that her father’s name was Constantine. Since Annie had a brother named Cornelius who went by “Con,” I surmised that this was more likely. Fortunately, another U.S.-generated document gave Julia’s parents’ names as Cornelius Cronin and Anne Cronin. I initially thought that the mother’s full identity was masked by her married name, but then considered the possibility that two Cronins had married each other. As a Smolenyak who married another Smolenyak, I regard such couples warmly. Plus, a Cronin-Cronin couple would stand out. Equipped with names for Julia’s parents and two probable siblings, I plunged into both civil registration (government) and church records to try to unearth a family that fit this profile. Imagine how pleased I was to spy a Cronin-Cronin couple with daughters named Mary and Anna. I finally had traction. Continuing to ping-pong between the two record sets, I steadily assembled a more complete list of Julia’s siblings. Julia’s brother Timothy caught my eye. Men are easier to follow since they retain their birth names, but more importantly, Timothy married in the same church as Julia just a year later. Tracing his family forward, I noticed that some of his children were born in the same neighborhood as Annie’s big brother. This seemed promising, so I ordered his civil registration marriage, and as anticipated, it gave his father’s name as Cornelius. I continued to piece together a family for Timothy through birth and baptism records, which proved more difficult than expected because he married a woman with the annoyingly common name of Mary Murphy. Worse yet, there were two Timothy Cronin-Mary Murphy couples in the area. Ah, the joys of Irish genealogy. 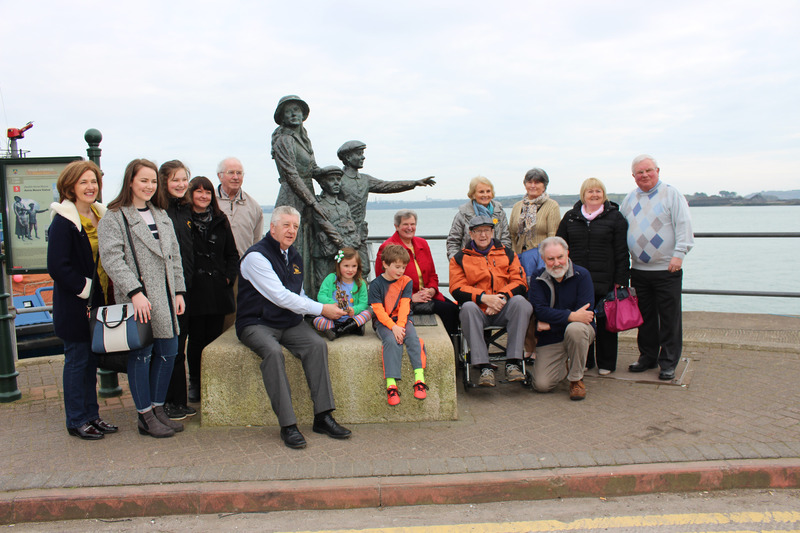 Several generations of Annie Moore’s Irish relatives gather at her statue at the Cobh Heritage Centre to celebrate their famous cousin. This unhappy coincidence made it necessary for me to do my best to assign a number of youngsters in the records to the correct pair of Tim-Mary parents. I did this by fast-forwarding to the 1901 census (www.census.nationalarchives.ie) to get a list of some of the children (along with their approximate birth years) for each couple. Due to the timing, some would have moved out or died, but this gave me most and showed that, say, couple A had a son named John around 1881, while couple B had a son of that name around 1886. Differences like this helped me sort the majority of Cronin offspring, and while I couldn’t be certain about every single child, I caught a break with a particular son. The Tim-Mary couple I was pursuing had a son named Richard in the 1901 census, and there was only one suitable Richard in the birth records. Richard was a slightly more unusual name than the ubiquitous Patrick and Michael, but I became more intrigued when I realized that he was with his parents in 1901, but not in the 1911 census. He could have died or emigrated, but I suspected that he had married, so looked for him in 1911 and one fellow stood out. Wed around 1905, he was working in Cork as a blacksmith – the same occupation as the Richard who had attracted my attention. Since so many were listed as “laborer,” this blacksmith designation was a bit of a tell. Wanting confirmation, I ordered his marriage certificate. His place of origin, occupation, and father’s name all fit. This was the right man. Now I had Richard and Lizzie Cronin with children named Timothy, Norah and Mary as of 1911, but how to traverse the last century? Once more, I turned to government indexes – this time for deaths. Seeking Richard Cronins who died between 1911 and 1964 (the most recent year available) revealed 28 men. I narrowed the field by location and age at death, and homed in on a fellow who died in 1954. In Ireland as elsewhere, privacy restrictions kick in around the 100-year mark, so I had reached the cross-your-fingers stage. Turning to online newspapers is an iffy prospect. If your family was prominent, you can find yourself fire-hosed with material, but for others, it’s a type-and-pray situation. Luckily, my prayers were answered and I found what I was looking for in Irish Newspaper Archives (www.irishnewsarchive.com): an obituary. It was brief, but I was optimistic because this Richard was a blacksmith. I mentally thanked him for his occupational choice, but sought more proof. Survivors’ names were not given, but his address was, and entering it in the search field surfaced obituaries for Elizabeth and Norah, his wife and daughter. This jibed with the 1911 census, so I was sure that this was the correct Richard. Still, I wasn’t done yet. Norah had died in 1988. How was I to bridge this gap of the last 28 years? Two churches in northern Cork were mentioned in the obituaries, so I asked Tim to visit. I was hoping for long memories. Tim met with Pat O’Leary, the sacristan at Our Lady Crowned, who kindly agreed to ask around and browse through their records. Days passed. Just as one year in a dog’s life is the equivalent of seven human years, one day to an expectant genealogist feels more like a month. I tried to sit tight, but the church’s Facebook page was too tempting. After a week, I could no longer resist the urge to repeat the inquiry by posting there. The double nudge produced a reply three days later. Mr. O’Leary provided fresh details, including the revelation that one of Richard’s grandsons, Tom Long, still lived in the area. After all this time, I was so close! Mr. O’Leary had prudently passed my email to Tom to allow him to reach out to me, but this time, I only lasted a day before caving to the impulse to use phone directories to find Tom’s contact information which I shared with Tim. The next day, Tim was in his living room explaining that he was the first cousin twice removed of Ellis Island’s Annie Moore – a connection previously unknown, but enthusiastically welcomed. I just found your website, a very very good job! . Did you every come across any Hickey-Cronin relations? My mothers family are the Hickey’s from the Cullen-Millstreet area. During the 1916 rebellion the Hickey’s & Cronin’s fought the British and have a monument to their bravery. I’d be happy to send whatever I have . In response to the above comment, I wish to say that I have Hickey ancestors on both sides. My paternal great-grandmother was Bridget Hickey Guiney, a native of Meemleitrim, Knocknagoshel, Kerry, and on my mother’s side, I had a great-great-grandmother named Mary Hickey Murphy who was also a Kerry native. My parents seemed to be 4th cousins thru the Hickeys. My maternal grandfather Maurice Murphy was a 2nd cousin of Dan Murphy, the Knocknagoshel blacksmith who was shot dead by Free State soldiers in March, 1923. This relationship was thru the Hickeys, not the Murphys. Catherine Schayer was my grandmother.